Vineyards owners from New York to Virginia know the damage that Northern whitetail deer cause. Deer eat grapes and vines, but it’s especially problematic when vines are young and trying to get established. Repellents are less effective once deer detect the presence of “food,” i.e. young vines. Once deer know where they can find “food,” they’ll continue to return until effective deterrents are put in place. There are nearly countless deer repellents on the market, everything from electronic to chemical, that are advertised for deterring deer and preventing deer damage; however, many of these products have significant drawbacks. Electronic deer repellent methods shock deer and they require constant attention to the battery to ensure they’re functioning properly. One of the common complaints about electronic deer deterrents is that the battery discharges in rain. Electronic deer deterrents also have a limited range, so depending on the number of acres your vineyard contains, you may have 100s or 1,000s of batteries to check. Chemical deterrents have to be reapplied regularly, which requires continues maintenance and cost. Chemical deterrents are also less effective in colder months when deer damage may be most prevalent. As an alternative to electronic and chemical deer deterrents, you might have considered (or even tried) deer harvesting. Some states provide permits you can use to harvest deer in an attempt to control the deer population, but that requires constant vigilance, especially at dawn and at dusk when deer are most actively seeking food. (2) Deer harvesting isn’t a long-term solution for controlling the deer population around your vineyard, but it could be a way to supplement other methods of deer damage control. So what are the best methods for deer control? 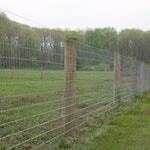 According to Mr. Curtis, fencing is one of the most reliable options of keeping deer out of your vineyard. Since other methods of deer deterrents are costly and require ongoing maintenance, consider a one-time investment in deer fencing. Deer fencing is a simple, cost-effective, low-maintenance way to minimize deer damage to your vines and to keep deer from eating grapes. 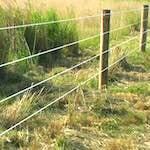 Of all the types of fencing available, including woven wire, plastic, steel, welded wire, fixed knot, invisible, ProFence recommends only high-tensile, woven wire deer fence for vineyards. 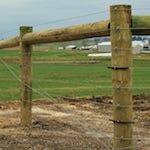 Why high tensile woven wire for fencing? The difference between non-tensile and high-tensile, woven wire is 2,000% more strength and increased elasticity. The extra strength will preserve your fence longer and spare any unnecessary future repairs. 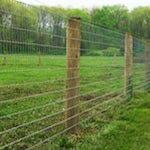 Ensuring that your woven wire fencing is installed properly is also critical for minimizing deer damage. 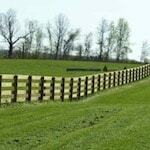 That’s why we also recommend working with a professional, experiencing fence installer like us. 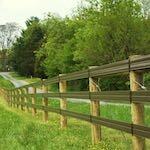 If you’re a vineyard owner in New York, Pennsylvania, Maryland, or Virginia and you’d like a quote for woven fire deer fencing, contact us today.